Please click here to access the draw for the Summer Meeting - Madge Maitland Cup at Dunfermline Golf Club, Monday 5th June. Alternatively, this can also be accessed by clicking in the Fixtures/Entries and Draw & Results Tab. Fiona Hastie, a FCLGA Member is embarking on a challenge to play all of the St Andrews Links Courses in the one day! Fiona and her team would like to raise awareness and funds for Maggie's Centres and Macmillan Cancer Support. Please click on the link below if you wish to support Fiona and the team and make a donation to 2 very worthwhile causes. 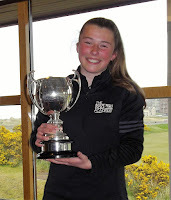 Anna McKay (Crail Golfing Society), only 13 years old, is the new Fife women's county golf champion, possibly the youngest ever winner of the title. In very windy conditions at the Jubilee Course, St Andrews, Anna beat Lorna McKinlay (Dunnikier) by one hole in an enthralling final. The handicap championship final also went to the 18th where Shona Hutchison (Dunnikier) beat Anne Shepherd (Lochgelly) by one hole. L McKinlay (Dunnikier) bt E Moffat (St Regulus) at 21st. J Mackie (Ladybank) bt L McDonald (Ladybank) 4 and 2. S Jackson (Ladybank) bt L Newton (Dunnikier) 6 and 5. A McKay (Crail GS) bt D Ford (Scotscraig) 5 and 3. McKinlay bt Mackie 5 and 3. McKay bt Jackson 6 and 4. McKay bt McKinlay 1 hole. A Shepherd (Lochgelly) bt B Lawlor (Crail GS) 1 hole. S Hutchison (Dunnikier) bt J Prentice (Ladybank) 3 and 1.